Celebrating starts and finishes is all very well, but we should also discuss the messy journey in between to improve our approach. This is all about the messy bit after launch and before selling your business, with lots of advice about what to do when there appears to be no end in sight. To find your way, you must employ tactics to endure your own self-doubt and the uncertainty and ambiguity that accompany every new venture. 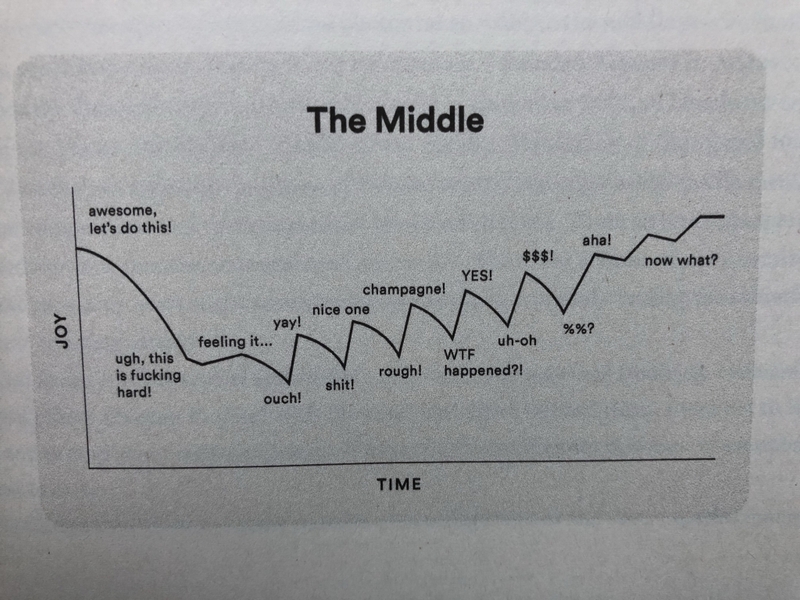 The relative joy of creating follows a path like the diagram. Aim to make each peak a little higher than the last one. Don’t celebrate fake wins at the expense of hard truths. Leave every conversation with energy. DYFJ: Do your f**king job. Don’t duck important decisions. Attempt a new perspective before you quit it. Prompt clarity with questions. There is power in brevity. Sometimes a reset is the only way forward. Playing the long game requires moves that don’t fit with traditional measures of productivity. Diversity drives differentiation: speaking more than one language helps people approach problems in multiple ways. If you avoid people who are polarizing, you avoid bold outcomes. When you have the right people, there are no rules for structure. A lot of big problems don’t get solved because we can solve small problems faster. OBECALP is placebo in reverse. Placebos often work. When you are doubting everything, take your own dose and suspend your disbeliefs in yourself. Insecurity work has no intended outcome, does not move things forward in any way, and is quick enough that you can do it unconsciously multiple times a day. Avoid it at all costs. The easy path will only take you to a crowded place – beware the path of least resistance. Learn from successes, not failures. Foster psychological safety so that people can really say what they mean. Organisational debt is the accumulation of changes that leaders should have made but didn’t. This can turn companies into a chaotic nightmare. Boulders are the hard things you have to do. Pebbles are the innumerable little tweaks that are rarely differentiating. Spend 80% of your time on boulders. Disney had three rooms: Room 1. Rampant idea generation with no constraints. Room 2. Aggregation and organisation of ideas. Room 3. Sweat box to critically review the whole project. Be fascinated by a problem that can be solved, not a topic. Ego is rust. Value and potential are destroyed in its slow decay. The danger of getting attention is that you stop paying attention. 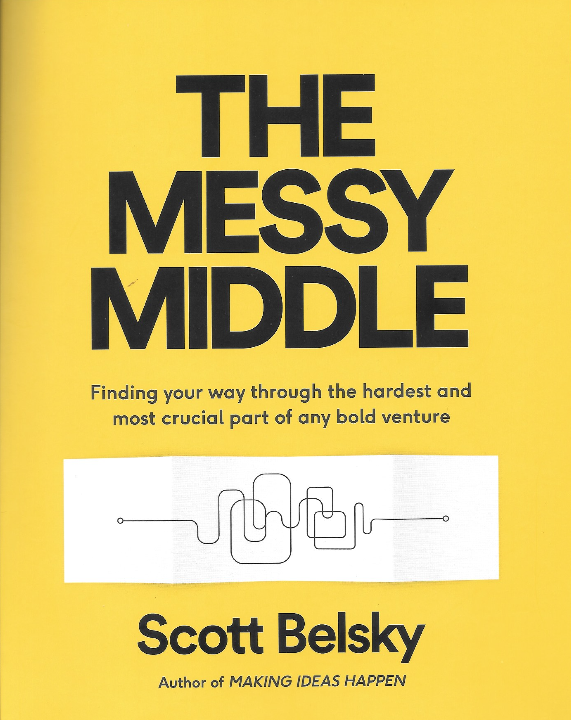 It would be easy to assume that this book is about the messy middle of project management, especially if anyone has read his previous book, Making Ideas Happen. The sub title, Finding your way through the hardest and most crucial part of any bold venture, could be misconstrued. The author is now a millionaire and investor, so much of this advice may be too ‘silicon valley’ for people with more modest aspirations.